Kurt Cobain may or may not have been my generation's John Lennon, but there's no doubt that his untimely 1994 death affected a lot of people and shook the music industry for years to come. Of course, the official story is that Cobain killed himself with a shotgun in a small room above his garage (seen at top); drug paraphernalia was found on the scene, and the bulk of Nirvana's lyrics weren't exactly sunny and upbeat. His soon-to-be ex-wife Courtney Love had hinted for months that Cobain was suicidal due to drug addiction and Nirvana's meteoric rise to success, further proven by his near-fatal overdose in Rome a few weeks earlier. So this was an open-and-shut case, right? Not exactly. 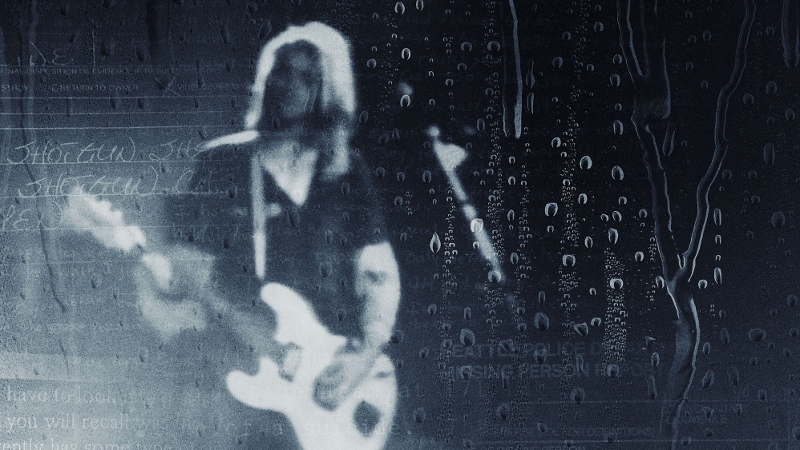 Benjamin Statler's Soaked in Bleach (2015) isn't the first documentary---or docudrama, more accurately--to profess that Cobain's death wasn't at his own hands, but it's destined to be the most influential. The bulk of it features expert first-hand testimony by private investigator Tom Grant, who was initially hired by Love in 1994 to investigate Cobain's disappearance several days before his body was found. Grant's memory is excellent and he recounts many interactions vividly, thanks to copious note-taking and a mountain of original audio recordings featuring Love, other Cobain acquaintances, and a few authorities. Grant chooses his words carefully, but smartly lets the evidence speak for itself. He's obviously passionate about the case and still convinced that the Seattle PD left many stones unturned...and during the bulk of this 90-minute docudrama, lays out his case neatly. He's not the only talking head: we also hear from former Seattle Police Chief Norm Stamper and former president of the American Academy of Forensic Sciences Cyril Wecht; only Stamper has first-hand experience on the actual case, but Wecht's involvement with dozens of high-profile death investigations (dating back to his 1965 criticism of the Warren Commission's conclusions about JFK's assassination) lends this film an additional measure of credibility. Slightly less effective by comparison, Soaked in Bleach makes use of occasional reenactments: though I normally despise such tactics (unless they're handled with care and creativity like Errol Morris' The Thin Blue Line), Soaked in Bleach splits the difference by fading out select bits of reenacted dialogue and replacing them with archived audio recordings. The effect can be jarring at first, but ultimately proves to be a unique tool in Grant's well-rounded arsenal. Not surprisingly, some of the aftermath isn't covered in detail: there's nary a mention of "collateral damage" like Kristen Pfaff (Hole's bassist and a friend of Cobain's, who died later in 1994 from a heroin overdose) and Eldon "El Duce" Hoke (notorious lead singer of The Mentors who claimed in 1997 that Love wanted him to kill Cobain, only to be struck by a train two days later). But in one respect, Tom Grant---and by extension, Soaked in Bleach---can't help but be driven by the fallout: there have been roughly 68 fan suicides in the wake of Cobain's death, and that's who Grant claims to be fighting for. It's an understandable motive but, nonetheless, takes a backseat to the film's attempts to reconstruct Cobain's final days and an evidence-based dissection of the Seattle PD's sloppy, unfinished work. From that perspective, Soaked in Bleach is absolutely successful: through expert testimony, unearthed evidence, and the aforementioned audio recordings, it does a fantastic job of raising awareness with an ultimate goal that Cobain's case be reopened. In direct contrast to the fluffy, Love-produced Montage of Heck (which opened two months earlier than Soaked in Bleach, but won't be released on Blu-ray/DVD until November), it's obviously more distant: there's no Nirvana music or treasure trove of adorable home movies, but Soaked in Bleach is all the better for it. It feels objective and honest despite an obvious agenda, and I'd imagine that most open-minded fans will immediately appreciate the difference. The DVD arrives courtesy of MVD Entertainment Group and includes a solid A/V presentation, but even a complete lack of extras (no deleted scenes?) can't stall the film's obvious staying power. Presented in a wider-than-expected 2.40:1 aspect ratio, the digitally-shot Soaked in Bleach looks on par with most modern documentaries, if not a half-step above. Newer "talking head" interviews are framed nicely and shot under dim lighting conditions (often with rain pouring in the background, which really heightens the mood), and the on-location reenactments look uniformly good with solid image detail, even color saturation, and consistent black levels. Archive footage---including VHS-grade and broadcast clips, as well as still photographs---is often centered at a more modest resolution and not cropped (see top image), which thankfully doesn't amplify the existing source material issues. Only a few hints of macro blocking and blooming could be spotted along the way; otherwise, this is a crisp and well-rendered presentation that looks good for DVD. A Blu-ray option would've been nice, though. DISCLAIMER: This review's compressed screen captures are strictly decorative and do not represent DVD's native 480p resolution. A Dolby Digital 5.1 track is our only option, and it serves up pretty much what you'd expect out of a documentary: interviews are anchored squarely up front, while reenactments and music cues (none of them Nirvana, obviously, just somber instrumentals and era-specific sound-alikes) drift more confidently into the rear channels. Optional English subtitles and captions are not included during this film, but audio recordings are paired with small, burned-in subtitles that don't block anything important. No foreign dubs or subs on this Region 1 locked disc, either. The only menu options are to play the movie or jump to one of its 19 chapters; that means no bonus features, surprisingly enough. Oddly, this one-disc release is housed in a clear, unbranded Blu-ray keepcase similar to Twilight Time's recent output; aside from two small DVD logos on the front cover and spine, the packaging might track casual buyers into thinking they've got a high-def edition that doesn't actually exist. No slipcover or inserts are included: the attractive two-sided artwork just briefly summarizes the film and identifies three of its leading authorities. Soaked in Bleach is another long-overdue investigation of a 21 year-old case that obviously has several large holes in it. Co-writer/director Benjamin Statler plays it smart by sticking to the evidence at hand, including expert testimonies, forensics, and original audio recordings, which heightens the film's impact and paints a compelling, accessible picture. The occasional reenactments can be a bit redundant and even distracting at times, although this visual stimulation does occasionally work in the film's favor (especially when paired with said audio recordings). Overall, Soaked in Bleach is a passionate project that obviously leans toward one side, but it's done so in a competent, detailed manner that urges viewers to make up their own minds. MVD Entertainment Group's DVD package comes up a little short, however: the A/V presentation is certainly good enough, but the lack of extras is a missed opportunity that may have added even more weight to a film that, nonetheless, stands up well on its own two feet. Casual fans can stick with a rental, while those extremely interested in the subject matter should pick this one up. Recommended.